The Social Security system has been the most successful social program of the US of the past century. Poverty among the elderly was common before Social Security. Such poverty is now rare. Enacted in 1935, the Social Security system has provided retirement and retiree survivor benefits to all, and has provided disability benefits to those who became disabled. While not generous in its benefits, Social Security acts as a minimum safety net for all, and as guaranteed pension income that supplements other sources of retirement savings. The system has been fully paid for through a dedicated payroll tax, at a rate currently of 12.4% on wage earnings of up to $106,800 per year (as of 2011; it is adjusted annually to reflect average wage growth in the economy). While the tax is formally paid half by the worker and half by the employer, in reality all comes from worker wages. But this popular, successful, and self-standing program will be under stress in the years ahead. While this has commonly been attributed to the stress caused by the upcoming retirement of the baby boomers, we will see below that the fundamental issue is rather longer life expectancies. Longer life expectancy a good thing, but it needs to be paid for. There will indeed be difficulties if nothing is done, and this has led, not surprisingly, to apocalyptic warnings by the Republican presidential candidates. Advocating for an end to Social Security as a government-run minimum safety net retirement program, the Republican candidates have forecast disaster. The most clear was Texas Governor Rick Perry, who in the September 7, 2011, GOP debate stated that “it [Social Security] is a monstrous lie. It is a Ponzi scheme to tell our kids that are 25 or 30 years old today, you’re paying into a program that’s going to be there.” Congressman Ron Paul had earlier, in the 2008 campaign, said (referring to the younger generation): “… there’s no money there, and they’re going to have to pay 50 years and they’re not going to get anything.” While the other Republican candidates did not go so far as to call it a Ponzi scheme, the impression conveyed remained that if nothing is done, Social Security payments to retirees would collapse to nothing once the Social Security Trust Fund ran out. If nothing is done, on current projections this would happen in 2038. All this reflects a fundamental misunderstanding of what the Social Security system is, how it operates, and what can be done to ensure its continued viability. Actually, there are a number of options on what can be done to ensure continued viability. This note will review a few. They are not that extreme, as the problem is not really that great. It is also true that while the problem of Social Security finances can be fairly easily resolved, major issues do exist with the other major entitlement program, Medicare and other health care costs borne through the government budget. These will require more fundamental reforms of the health care financing system in the US. The Obama reforms make a start on this, and are a step in the right direction, but do not go far enough. But health system financing is not the issue being addressed in this note here. The historical data and the projections come from the Congressional Budget Office, in an August 2011 report. Long term projections are necessary, but are of course subject to a good deal of uncertainty. Up until 2009, more was paid each year in payroll taxes for Social Security (for both retirement and disability) than was paid out in benefits. The Social Security Trust Fund (an account at the US Treasury) grew each year. But starting in 2010, with an expansion in the number of citizens enrolling in Social Security benefits (with many taking early retirement in the 2008 downturn and then slow recovery, with unemployment high), outlays bumped up while revenues bumped down, and the expected cross-over between outlays and revenues was brought a few years earlier than had been expected before. The bumps around the trends are clear in the diagram. Going forward, outlays are expected to rise to about 6.1% of GDP by about 2035, with revenues then of about 4.9% of GDP, leading to deficits of about 1.2% of GDP. But it is interesting and important to note that outlays are then expected to be largely steady as a share of GDP for at least the next 50 years, and maybe longer, falling a bit at first and then rising a bit. Revenues are expected to rise by a small amount over time, to about 5.1% of GDP by 2052, and then be flat. Deficits will fluctuate within a relatively narrow band of about 1% of GDP after 2035. This is important. Politicians opposed to Social Security have conveyed the impression that Social Security deficits will rise steadily over time forever, and thus that the problem is not solvable in the current system. That is not the case. The deficits will grow to about 1% of GDP, which is of course significant, but then they are expected to stay at roughly that level for the foreseeable future after that. Note also that if nothing is done, benefits paid out under Social Security to retirees and the disabled would not immediately drop to zero should the Social Security Trust Fund be depleted. On current projections, the balance in the Trust Fund would, if nothing is done, drop to zero in about 2038. But in those years, Social Security revenues would still come to 5.0% of GDP each year. Hence benefits equal to 5.0% of GDP would still be paid. This would require a scaling back of benefits of about 18 to 19% in those years relative to what would be due. While it would be irresponsible and inexcusable for the politicians to have allowed it to get to that point, scaling back of benefits by 18 to 19% is quite different than saying they would then drop to nothing, as Governor Perry and Congressman Paul asserted. What could be done to cover the 1% of GDP deficit? As noted above, such a deficit could be covered by general tax revenues. It would not be that much, and indeed equal only to one-third of the revenues that would be lost in those years should the Bush tax cuts be extended, as all the Republican presidential candidates have vociferously argued for. Indeed, the Republican candidates have all set forth proposals for even far larger tax cuts than these, as was discussed in a past post. If the country can afford such tax cuts, any one of which would be a large multiple of the revenues required to cover Social Security obligations, then it can afford what is needed to cover Social Security. But setting aside for now the option of covering the Social Security deficit from other revenue sources, what would be the options should they be constrained purely to the current Social Security system itself? By definition, they could then come only from three possible sources: lower administrative costs, higher payroll tax rates, or lower benefits. We will take up each in turn. Social Security administrative costs in 2010 were only 0.9% of what was paid out in benefits in that year. And they have been at about this level, of below 1% of outlays, each year since 1990. They are even lower for the retirement component, at only 0.6% of benefits paid in the year, while somewhat more (at 2.3%) for the disability component, as disability requires closer monitoring and more complicated assessment of cases. These administrative costs are incredibly low. It is important to keep in mind that these are costs compared to annual outlays. Private retirement programs, as annuities or managed through 401k’s or similar programs, will typically have annual expenses of 1 to 2% of assets. Assuming even a highly generous rate of return on assets of 10% a year, admin expenses of 1 to 2% of assets will eat up 10 to 20% of returns and hence benefits. Social Security admin expenses of just 0.9% (and 0.6% on the retirement component) is far superior to the 10 to 20% cost that private plans charge. The Government run Social Security system is incredibly efficient, and one should not expect to be able to reduce the admin expenses significantly further. The second option is to increase the payroll tax rate. There is no reason why this cannot be done, and indeed the payroll tax rate was increased 21 times in the 40 years between 1950 and 1990. But since 1990, i.e. for over 20 years now, the payroll tax rate has never been changed, but rather held constant at 12.4%. The Social Security deficit problem that has now appeared is largely due to this. The diagram shows the ratio of the size of the Social Security Trust Fund to the benefits paid out each year, all as a share of GDP. The calculations were done based on the data accompanying the August 2011 CBO report cited above. Interest earned in the Trust Fund (at the rate for US Treasuries) was accounted for. In all scenarios, benefits were left as projected by the CBO, even though under the current benefit formulas, benefits would adjust if payroll tax collections are. That is, I am assuming that the benefit formulas would be adjusted so that benefits would remain neutral, at the levels projected in the base case despite higher payroll tax collections in the scenarios. In the base case (shown in green with the square symbols), the Trust Fund ratio will reach a peak of 17.5% of GDP in 2012, but will then fall if nothing is done until reaching zero in about 2038. At that point it will be falling by about 1% of GDP each year (equal to the annual deficit, as discussed above). Unless supplemented by general tax revenues (which could be done, as noted above), or by a payroll tax rise, benefits would need to be scaled back by about 18 or 19% to reflect the 5.0% of GDP payroll tax collections expected for those years with the current tax rates. The question is what rate of payroll tax would be necessary so that benefits would not need to be crudely scaled back by such an amount. To help understand what is going on, in the first scenario we look at a case that helps explain why Social Security finances have deteriorated. As has been noted in previous posts, wage compensation has lagged profits in recent years, and in particular over the last decade. As a consequence, the wage share of GDP has fallen. Since the Social Security payroll tax is on wages up to some limit (with that limit adjusted annually based on average wage rates), the smaller share of wages in GDP has translated into a smaller share in GDP of payroll subject to the Social Security tax. Prior to 2000 (back to at least 1985, when the CBO data starts), this ratio had always been close to 40% of GDP, and in 2000 it was equal to exactly 40.0%. It was still at 40.2% of GDP in 2001, but then it fell significantly, to 37% of GDP by 2010, where the CBO expects it to remain (+/- about a half percent) to at least 2085. Scenario 1 looks at the case where we assume the taxable wage share had remained at 40% of GDP from 2001 onwards. With benefits unchanged, this alone would extend the date the Trust Fund ratio would fall to zero, from the year 2038 in the base to 2063, or 25 years later. That is, part of the reason the Social Security Trust Fund is in difficulty is the compression in wages subject to the payroll tax (to the benefit of profits and high income workers) over the last decade. Without this compression (and leaving benefits unchanged), the Trust Fund would be sustained even at the current payroll tax rate for a further 25 years. But countering this wage compression cannot be accomplished by some administrative rule. It is what it is, for complex reasons. 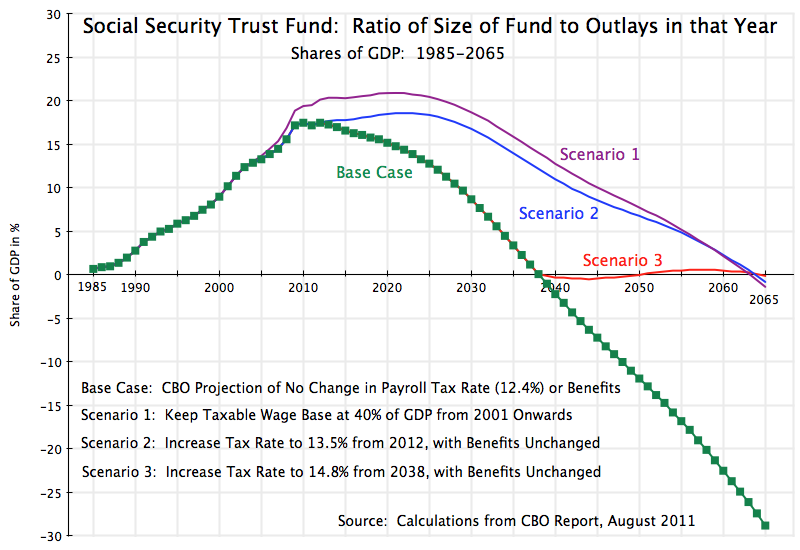 Scenario 2 then examines what increase in the payroll tax would lead to a similar 25 year extension of the life of the Trust Fund before it would be depleted. Scenario 2 shows that an increase in the payroll tax rate from the current 12.4% to just 13.5%, starting in 2012, would suffice to do this. Such an increase in the payroll tax rate is not so large. A payroll tax increase to a 13.5% rate in Scenario 2 would still not be a permanent solution, however. The Trust Fund ratio would be falling in 2065, and would continue to fall if nothing further is done. Scenario 3 then looks at what the payroll tax rate would need to be to put the system in balance, with the change only made in 2038. Until 2038, the Trust Fund would be allowed to be brought down from its current high balance. Scenario 3 shows that a payroll tax rate of 14.8% (from 12.4% until 2038) would do this. The system would then be roughly in balance, until at least 2065 (on current CBO projections). An increase in the payroll tax rate from 12.4% to 14.8% is a bit less than a 20% increase in the rate. It is no coincidence that raising revenues from 5% of GDP projected in the base case to the 6% of GDP required to cover scheduled benefits is also 20%. They are basically the same thing. But an interesting question is why did such a 20% gap open up. The special Social Security Commission chaired by Alan Greenspan, established by President Reagan in December 1981 and reporting back in January 1983, proposed changes in the payroll tax rate and other measures to allow the Social Security Trust Fund to suffice to cover expected benefits for a 75 year period, i.e. to 2058. On current projections, it is now expected to suffice for only 55 years (from 1983 to 2038). One cause of this, as considered above as Scenario 1, is the compression of wages as a share of GDP that Americans have experienced since 2000. Without this (although leaving benefits unchanged), the Trust Fund would be projected to last until 2065. The unexpected compression in wages may therefore explain why changes are now required to cover a projected Social Security deficit. But an additional, and more fundamental cause, is lengthening life expectancies. This will be addressed next below. Social Security pays retirement benefits from retirement age (originally age 65, but currently 67 for those born in 1960 and later, and where reduced benefits can be obtained as early as age 62) until death. But expected lifetimes have grown. Some observers have noted that life expectancy was just 62 in 1935, when Social Security was passed (with a retirement age of 65), and is now 75. While true, these are not really the numbers needed. The increase in life expectancy has been largely driven by reductions in infant mortality, and those who die in infancy never enter the work force. Rather, one needs to look at the likelihood that those entering the work force will live to retirement age, plus the remaining life expectancy for someone who has reached retirement age. While technically one needs to look at the full distribution of probabilities, two figures will suffice for the purposes here: the percentage of the population at age 21 who will survive to age 65, and the average remaining life expectancy for someone who has reached age 65. In 1940, 57% of those aged 21 were expected to survive to age 65, and for those reaching 65 the average remaining life expectancy was 14 years. Thus, Social Security retirement benefits were on average expected to cover 8 years of benefits (= 57% of 14 years). But by 2010, this had more than doubled to 17 years. That is, even with constant retirement benefits paid each year, the total expected to be paid out will have more than doubled. Longer life expectancy is of course a good thing. But the extra costs need to be covered. But if one rules out use of general tax revenues, and rules out also any changes in the payroll tax rate, and with admin costs that are already minimal, all that is left is to cut benefits. But benefits are already low, as Social Security simply provides a low floor level of income sufficient to keep most out of poverty, and not much more. The average Social Security retirement benefit paid in 2011 was only $14,124, and was less for lower income workers. These cannot go lower without putting the elderly who depend on Social Security into poverty. One might also consider raising the normal retirement age, thus reducing the number of years expected to be covered by Social Security. But while average expected lifetimes (and hence the expected number of years under Social Security) have risen, most of this increase in recent decades has been among higher income workers. Lower income workers, who depend most on Social Security, have not seen such an increase in life expectancy. A study by Hilary Waldron of the Social Security Administration, published in the Social Security Bulletin, vol. 67, no. 3, 2007, found that the average expected remaining lifetime of a male aged 65 rose from 15.5 years to 21.5 years (an increase of 6.0 years) between 1977 and 2006 for someone in the top half of the wage distribution, but only from 14.8 years to 16.1 years (an increase of 1.3 years) for someone in the bottom half of the wage distribution. Thus while remaining life expectancies at age 65 have risen, this has mostly been due to the increases by those enjoying relatively high incomes. It would be perverse then to penalize lower income workers by reducing their already low benefits, to cover the costs associated with more years of payments to those enjoying increased years of life expectancy at the upper end of the income distribution. Should one therefore choose to cut benefits to cover the Social Security deficit, the cuts should be focused on those at the higher income levels. The distribution formula for retirement benefits under Social Security is already modestly progressive, and it could be made more progressive. One could also do this by coupling an increase in the normal retirement age with a more progressive distribution of benefits, with the extent of this increased progressivity sufficient to ensure lower income workers are not penalized by the improvement in living standards that those with higher income have mostly enjoyed. 1) There would no longer be a minimum floor income that all Americans would be able to count on in their old age. Social Security provides this minimum floor. And for almost all Americans, Social Security is only one of several sources of income they receive in their retirement: It is a supplement to income received through company pension plans, tax-advantaged savings through IRA’s and 401k’s and similar programs, and other savings they have built. There is nothing that blocks those enrolled in Social Security also to save via these other forms for their retirement, and indeed such savings is strongly encouraged. But under the Republican proposals, the Social Security pillar in the set of alternative savings schemes would be eliminated, and would no longer exist as a safety net for all. 2) By moving the revenues now going to Social Security to self-managed investments such as 401k’s, one will be forcing people to take on the risks of 401k’s. Those whose 401k’s were invested in the equity markets know how risky this can be, following the crash of 2008. 3) Savings invested through the equivalent of 401k’s will have to pay the administrative costs of such investments, which are an order of magnitude higher than they are for Social Security, as was discussed above. Admin expenses for Social Security retirement programs are only 0.6% of benefits paid. For private investments, the share will depend on the returns, but could easily be 10 to 20% of benefits. The only beneficiaries of these Republican proposals would be the private investment management companies, who would enjoy fees an order of magnitude greater than the costs Social Security incurs. 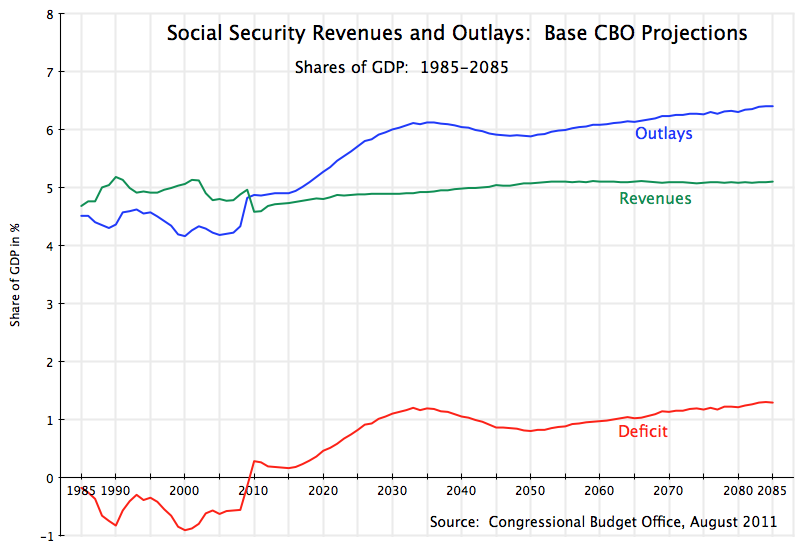 4) Finally, redirecting payroll taxes from Social Security to new privately-directed accounts would lead to a fiscal crisis, as the Government would lose revenues equal to about 5% of GDP, while benefits to existing retirees (and those soon to retire) would need to continue. None of the Republicans have said how this increase in the deficit of 5% of GDP would be covered. The different Republican plans differ in detail, but are largely similar in their outline. The most absurd is the one proposed by Newt Gingrich, where he would provide a guaranteed floor income to all, equal to what Social Security now pays. While this would seemingly address the first point noted above (of no more a minimum floor income in retirement), Gingrich says nothing on how the cost of this would be covered. Not only would he redirect the 5% of GDP in payroll taxes away from the Social Security system, but he would also take on a commitment to provide up to 6% of GDP for the benefits that would be due under Social Security, should the private investments fail. The potential gap would be 11% of GDP. It would be a fiscal disaster to ignore this. 1) If nothing is done, the Social Security system will be running a deficit that will rise to about 1% of GDP by 2030. But while significant, this deficit is then forecast to remain at roughly this level until at least 2085 on current projections. Such a deficit is manageable. 2) The deficit has increased due to lengthening life expectancies (in particular by upper income people) and due to the compression in wages seen since 2000. 3) If nothing is done, then on current projections, the Social Security Trust Fund will be drawn down to zero by 2038. But that does not mean Social Security payments to retirees and the disabled would then have to drop to zero, as Republican presidential candidates have stated. There would still be on-going payroll tax revenues of about 5.0% of GDP, which would cover benefits reduced by 18 to 19% from their scheduled levels. a) Use of general tax revenues. The 1% of GDP would be covered simply by scaling back the Bush tax cuts by one-third. b) An increase of the payroll tax rate. An increase in the rate from the current 12.4% to a rate of 14.8% from 2038 onwards would suffice. c) One could also in principle cut benefits, but this is not recommended. The benefits are already low, and provide a minimum floor income for the elderly as a safety net. If benefits were to be cut, they should be cut for the higher income recipients (who have mostly enjoyed the increase in life expectancy that is stressing the system) rather than the lower income recipients. 5) The Republican proposals to privatize the system would end Social Security as a minimum safety net for all Americans, would expose everyone to market risks, and would be fiscally irresponsible as revenues equal to 5% of GDP would be lost. The only beneficiaries would be the private investment management companies who would supervise the new accounts, and who charge fees an order of magnitude higher than the administrative costs of the Social Security Administration. This entry was posted in Economics Applied, Fiscal Issues and tagged entitlements, fiscal deficit, policy, Social Security, taxes, US politics by aneconomicsense. Bookmark the permalink.